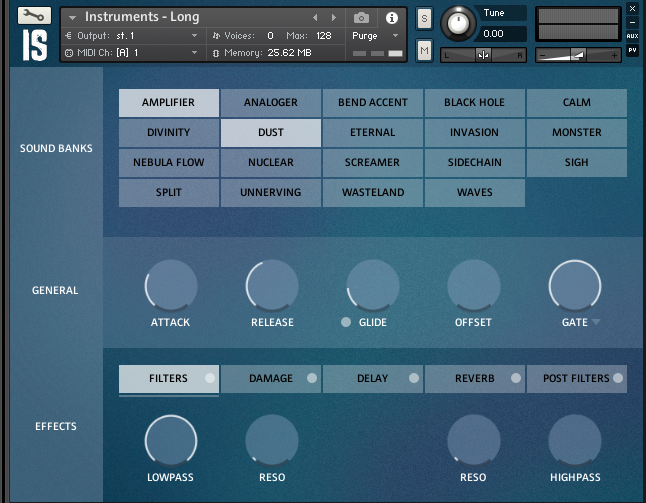 Veil is a brand new library from Instant Sonics. Their last offering was the Silver Screen Toolkit, which I reviewed a few months back. While the Silver Screen Toolkit was a large and varied library, Veil is significantly smaller and much more focused, this time offering a great collection of pads and cinematic textures. The library costs $25, comes in at just under 1.5 GB, and requires the full version of Kontakt to run. The GUI is clean and simple, similar to Silver Screen Toolkit. I really like the clean GUI of Veil. To be honest, I rarely use built in FX with any Kontakt instrument, but the libraries from Instant Sonics seem to always be an exception. I grew up with VST soft synths, so there is a sense of familiarity with the various effects, dials, and knobs represented in the GUI of Veil. The on board effects are plentiful and powerful, offering an arpeggiator, filters, distortion, gating, ADSR, and echoes, which enables delay and reverb all generated in a powerful convolution engine, with several reverb presets to choose from. Different variations of effects can be applied independently to each sound source, which is a nice touch. There’s also a randomize function for instant inspiration. The heart of this instrument is a dual layer sample engine, allowing you to load up to two sound sources at once and seamlessly mix between them and blend as you see fit. Each generator has four separate categories to load sounds from: Pads, Plucks, Rhythmic, and Other. The Pads category easily takes the cake for the most sound sources available. The sounds included are really fantastic overall, and very textural. While the sounds may sound similar to some synths at first, what sets them apart is the unique, evolving textures embedded in each sound. You get a large variety of sounds, and each pad evolves as you hold down the keys. For instance, the “Bubbles” pad has a bit of a mild glitchy effect, and “Desert Winds” invokes the sound of wind blowing across a natural landscape. Each sound is fairly unique, and most are instantly useable, just drop them into a track and they will stand on their own, not to mention the fun that can be had blending them together. While the sounds in the Pads section are unique and differentiate from one another, a few of the sounds on their own can be just a tad generic, but, this library isn’t about loading up just one sound source, and that initial feeling disappears quickly once you dive in and start tinkering. Experimenting and getting creative is what this library is all about. When you also take into consideration the fact you could literally experiment for hours with the onboard effects, it’s pretty impressive the amount of content you get for just $25. The other sections are much smaller, but they all deliver. The plucks are typical EDM style plucked sounds, but again, experimenting with the echoes and convolution effects prove to be a real joy, no matter what the initial sound happens to be. The rhythmic section sounds a bit more loop based, sometimes sounding like a cross between a synth pulse and a pad with a trance-gate effect. The “other” section seems to be a grab bag of stingers and transitions, with a couple phat synth sounds thrown in and one really quirky sound (Sunrise String) that has a synthetic, human-voice type sound. From etheral soundscapes, haunting and unnerving drones, and everything in between, this library delivers. I was very impressed with the variety of sounds and the incredible quality of the on-board FX engines. The evolving nature of the sounds and the sound shaping capabilities are top notch. I almost always use third party reverbs and effects, but the included effects are very satisfying, which is a huge plus. Instant Sonics is one company I find myself not wanting to each for the third party effects, I feel satisfied just playing around with the on-board settings. I really love smaller and more focused libraries, and while I really enjoyed their last offering, Silver Screen Toolkit, I think the lower price tag and increased focus of Veil will go a long way to making Instant Sonics a household name. I would definitely recommend this product for someone looking for cinematic textures and soundscapes, especially for those who love to get creative and have fun tweaking dials and layering FX. + Fantastic sounds and on board effects engine. + A lot of content and fun for a really great price. + Offers a wide variety of unique textures and encourages hours of creativity and experimentation. - May have trouble sorting through the different pads and remembering which one was your favorite. Today we’re going to explore a brand new sound design library for Kontakt, The Silver Screen Toolkit by Instant Sonics. This is a brand new library, the first one released by Instant Sonics, so it’s fairly unknown at the time of this write-up. Instant Sonics reached out to me in order to get an in-depth and honest review of their brand new product, and provided a copy, free of charge, for me to test and critique. There is very little information out there about this product and the company behind it, so I will share what resources there are so far, and try to go beyond that and provide a very detailed and in depth look at this library! First off, here’s a demo track made ONLY with sounds included in the Silver Screen Toolkit and a third party reverb- and be sure to check the detailed walkthrough/demo video at the bottom of the page! This library retails for $150.00 here at the official site. The official thread here at VI-Control can provide more details about the specifics, and there is also more info and it’s available for purchase here at Kontakt Hub. It’s primarily a sound design library, aimed at modern cinematic music, and provides a very large variety of sounds. I’d say it’s very much focused on providing electronic, modern, cutting edge sounds and effects for hybrid and trailer music, though I could see it covering underscore, ambient, even straight up EDM. The nature of the sounds is very electronic as opposed to orchestral. The library provides 3.6 gb of content. The interface of this product is very basic and not flashy at all, unlike similar libraries such as Collision FX by Soundyeti and some of the libraries from Sampletraxx. However, this doesn’t bother me, as it is clear and very easy to use. With an unknown library such as this, I’m much more concerned with the quality of sounds and ease of use than having a flashy and cutting edge interface. Upon installing (quick and easy extract from the .rar file into your libraries folder) I was initially a bit shocked to see that this library contains a whopping 44 .nki files! However, they are all labelled appropriately and easy to navigate (unlike the aforementioned Collision FX). Each .nki file is very focused and specific, for instance, providing a separate .nki file for every “Complex Kit” drum patch, instead of loading up one .nki and cycling thru the kits in the interface itself. Some may find this a bit overwhelming at first glance, but I really don’t mind it, as they all have names that are very easy to identify. The GUI has three sections: “Waveform”, which displays the visual waveform of the sample being played, and contains a slider for the sample start time. Keep in mind, this is a global settings, and not only does it change the sample start point for the current sample, but for every other sample contained in the .nki file as well, which could easily be an annoyance for some. Beneath that, we have controls for Attack, Release, Speed (which controls the speed of the long samples like risers and swells), and a Gate. The speed knob is nice, in case you place a riser in the MIDI sequencer that doesn’t quite sync perfectly with the timing of your track, you can adjust how quickly it will play with this knob, although there is no numerical value associated with the setting here. Alternatively you can adjust the placement of the actual note in the sequencer. If you set the speed knob to the slowest setting possible, the sample becomes very strained and stretched. Either way, it is nice to have it there, just in case you wish to tweak these sounds further. The gate is one of my favorite features, as it simply applies a “trance-gate” type effect to the samples, which can be set for various note intervals, and adjusting this slider controls the tightness of the gate effect. 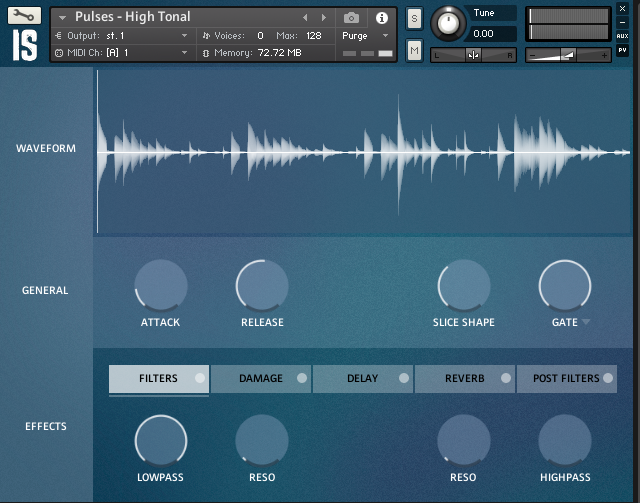 Use this to instantly add stutter effects and movement to any of the samples. The effects rack includes Filters, Damage (distortion/overdrive/bitcrusher), Reverb, Delay, and Post Filters. I really liked having a low pass filter built in to the GUI, and the Damage section can really add a lot of character and punishment to the sounds. As you can see below, the library contains a MASSIVE amount of .nki files, and is separated into four major categories, Drums, Effects, Instruments, and Pulses. That’s a lot of patches…. Green keys play the various bass drum type samples, yellow plays snare sounds, and the red keys play hi-hat type sounds and assorted auxiliary percussion. Some of these sound very glitchy and crushed, somewhat similar to some of the kits from Heavyocity’s Damage, others are more clean and remind me more of a radio friendly hip hop or trap beat. Either way you have a fairly wide variety of sounds here, although some of the kits sound overly similar, they all provided quality sounds. Next up is “Effects”, which is the largest category here, and where my favorite sounds this library produces are contained. They contain sounds such as Alarms, Booms, Bends, Braams, Drops, Hits, Risers, Swells, Transitions, and Whooshes. Most of the sounds are self explanatory, and there is a lot to enjoy here. Some of the samples do sound a bit similar, just thrown through different processing techniques, with the further ability to add your own distortion, delay, reverb, and filters with the built in effects rack. Tonal effects such as “Braams” have pitch control mapped to the lower keys of your MIDI keyboard. The standouts here are Bends, Drops, Risers, Swells, Swell Drops, Timbres (basically atmospheric textures), Tonal Reverses, and the Whoosh Hits. Each of these patches contains a nice variety of sounds, and many of them are instantly usable in any kind of trailer or hybrid track. My favorite sounds produced by the Silver Screen Toolkit are those that are saturated and heavy, and there’s definitely a nice amount of them included. The risers are modern and intense, the swells are massive and brooding, the Drops are earth shaking and provide incredible sub-bass, as well as the Swell Drops. The Timbres really add atmosphere and textures to your tracks, and are more subtle, but still can be aggressive and moody. The Whoosh Hits are short on the riser and very punchy on the hit, and are perfect for transitions and endings. The Tonal Reverses have a very long attack and build up to a short, but thick and aggressive, swell. Long Instruments patch and the variety of sound banks included. Next we have the “Instruments” section, which contains Long (synth leads, bass pads, etc) amd Short (plucks, etc). There is a variety of sound banks here, and while it may not seem like a lot, they can be stacked in any combination, resulting in some fun experimentation and many possibilities. They cover a variety of tones, from soft and airy to harsh and gritty, but some seem to lack the thickness of some VST synths, especially in the bass spectrum. I find these to work best for leads, though they can also easily provide pad sounds as well, and they work exceptionally well while playing with the low pass filter. Having melodic synth-like instruments here is a very nice addition and they work very well, especially with the “Glide” setting which enables portamento. The Short Instruments patch contains less sound banks, and generally covers pluck sounds. Just these two instruments alone, and the effects included, are easily capable of producing slick and modern EDM sounds, and truly surprised me with how well they performed, as some Kontakt based “synths” leave a lot to be desired. The variety of sounds isn’t anywhere near what a standalone VST synth can offer, and don’t expect anything like a massive and thick supersaw, but they are very capable of holding their own in any hybrid track. The last section is Pulses, which come in High and Low variations. These also have pitch control mapped to the lower keys. I think these could have been better labeled as well. For instance, some contain melodic arpeggios and others are just one pitch 16th notes. Some are also light and airy and very clean, while others are overdriven and harsh. There are some great sounds here, though not much customization (no step sequencer, no multi note arps, etc). I preferred the high melodic pulses, as they are really nice and modern. For the most part, the Low Pulses were just the same 16th note pattern, with each sample simply having different levels of distortion and other processing applied. While there is still some good content, overall I found them to be lacking, and in need of some more customization options, such as a step sequencer or an arpeggiator. While this library provides an amazing variety of sounds and many of them are top notch, not every single sample is a winner, and some seem a bit too harshly processed. The “Assorted” patches were strange, as they contained some good sounds but were scattered across the keyboard seemingly at random, never knowing what you’re going to get, and once you do find a good sound, it’s very easy to simply forget where it was mapped. I think the “assorted” patches could be better labeled, such as “assorted percs”, “assorted tonal”, “assorted atonal”, “assorted texture”, etc, as this patch contains everything from a short metallic hi-hat to a distorted dub-step type wobble. The alarms category is pretty underwhelming, and overall provides content you can make with a VST Synth and bending the pitch (certain sounds in general didn’t seem to be anything groundbreaking, just synth based with some basic processing, and I feel I could make these sounds on my own). For the most part, the “Booms” were lacking in the sub-bass spectrum. The Braams are also lacking the intensity and character provided in other libraries, such as Keepforest’s Evolution Atlantica, and this library seems to be lacking in the bass area, which would otherwise make this an almost perfectly rounded package. There’s plenty of sub bass drops and what not, but as far as a Bass Instrument, it seems to be lacking in this area. Other than the critiques mentioned above, the sheer variety and quality of sounds included is very nice, and you could easily make an entire track simply with this one library, as it provides drum kits, trailer effects, melodic synths, and pulses, all in one 3.6 gb Kontakt Library. Many of the categories included here could easily be sold as one single Kontakt Library, and they have included all of them in one, and none of them feel truly tacked on, with the exception of some of the pulses. I think this would be a great library for the beginner trailer composer, as it includes everything you could need in one place. To those more advanced who own more dedicated libraries, there may not be a lot here that’s new to you. I personally own many more specialized products, however you also have to consider the price paid for what you get, and I do believe this is a good and well rounded package. I can almost guarantee you I will be using the effects provided, as they are easy to use and offer nice options for tweaking the samples, and while some of the sounds lack the character of more expensive libraries, they also serve as a great starting point to apply some of your own sound design techniques and take them to the next level. +Many top notch and instantly usable sounds. +Easy to use interface and nice assortment of effects and customization options. -Some sounds lack the polish and character of more expensive libraries. -Some of the sounds could be better categorized/labelled.